Jill Gibson was born in California, studied painting at the Art Student's League, NY in the 60's, lived in Italy and Mexico, and has shown her work nationally and internationally. 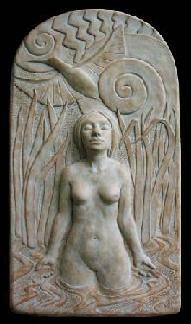 She's been working with clay and concrete bas relief sculptures since 1997. 'A small spontaneous sketch is born. I dress that inspiration with form, texture, and light, I multiply it many times, thus becoming an exchange of energy with the world. Female figures, animals, plants, seeds, fabric, windows, horizons, water, vessels, wind, earth, sky, act as metaphors for energies within.' She works in Sonoma, CA with various mediums that in turn influence her images.